This truck is a D-100 with the High Performance package. The original owner, Hobe Simons, special ordered it in May of 1964. He wanted it to come without the bucket seats. The truck was ordered with the 426 cu in street wedge, power steering, dual exhaust, torque rods, push button transmission and 3.55 gears. He took factory delivery in August of 1964 at the Warren, Michigan truck plant just as the 1965 model year trucks were coming off the assembly line. 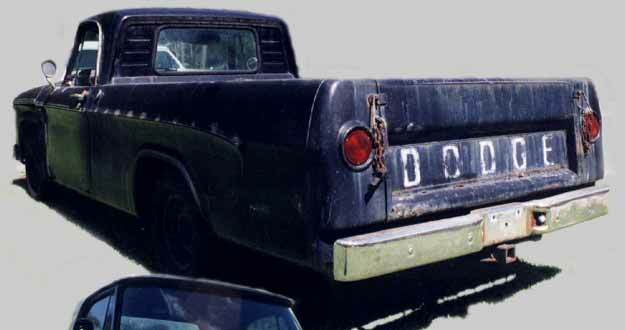 The truck was primarily used as a parts go getter for Hobe's Service Station. From late 1964 to 1973 my mother would go grab parts from suppliers while customer cars were being serviced at the Phillips 66 and later the Gulf station in south west St. Petersburg. Imagine how quick a 365hp truck was to pickup parts was! This truck is now owned by the original owner's son, Ben Simons, and is located near Gainesville, FL. Hobe has plenty more stories. As they are recorded, the stories will be posted. Warranty disclaimer sticker. H.D. gauges, bench seat and no console. 426 Street wedge. Truck is now being restored - check out my progress.